Fairtrade is a household name – but FLOCERT, the Fairtrade-owned company that had been auditing and certifying Fairtrade producers and traders for ten years, had been almost invisible. In that time the business of certifying ethical practices in supply chain had been transformed. FLOCERT itself had pioneered ways to assess and assure. And more brands had begun to set their own agendas for transforming their supply chains for the better. 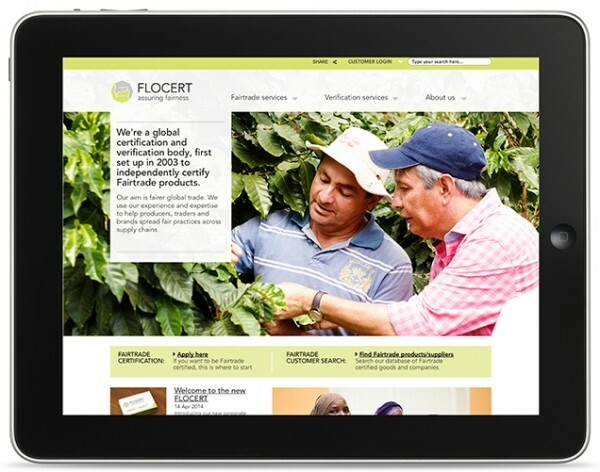 With all the experience gained from shaping the process for Fairtrade International, FLOCERT could see an opportunity to reach out to new audiences, under its own identity. FLOCERT came to Neo for a new brand and website, to help them reach new audiences with new services. 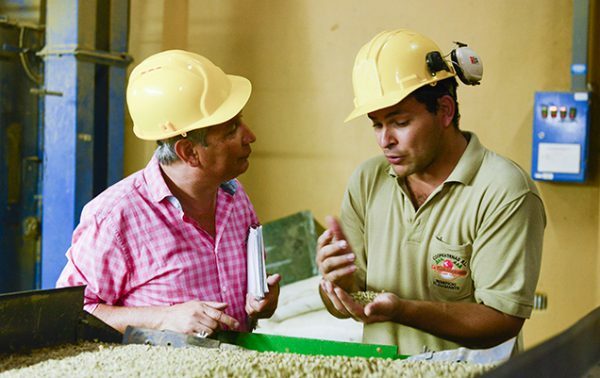 At the same time, they wanted to improve their communications with the thousands of existing customers around the world, many of them small-scale farmers, who rely on them to certify their products as Fairtrade. We began with the biggest piece of stakeholder research we’d ever taken on. We found out everything we could about the business strategy, culture and values, looking into FLOCERT’s role in the Fairtrade system, and the lively debate about the future of labeling for ethical practices. We spoke to as many people as we could across four continents, from frontline staff and customers to senior stakeholders, board members and partners. We asked every FLOCERT employee their opinion on the existing positioning and brand. That gave us enough to create a strategic foundation, that outlined the priority issues around rebranding the organisation and opportunities to explore. The big tension was reflecting the huge importance of the relationship with Fairtrade while also enabling FLOCERT to innovate and move into new markets. This platform formed the basis of both the brand and digital development. At first, the opportunity seemed clear: ‘hold the line’ and neither move closer to Fairtrade brand or away from it with the new identity. But brand projects are always moving targets, and six months in the business strategy shifted. 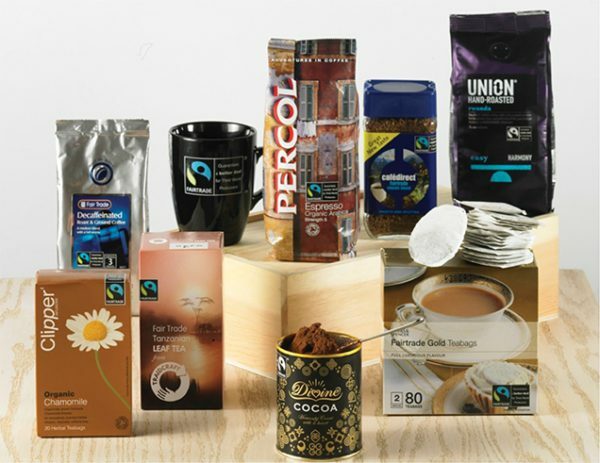 We all had to respond to a new priority – reaffirming the close link with Fairtrade more strongly, and working with a more phased approach to the rollout of new services. Having developed our thinking so far already, we needed to pull things apart again. Which was painful, but helped to us get the alignment we needed. It’s not tick-boxes and spreadsheets that best represent FLOCERT’s role in the world: it’s their ability to deliver fair global trade that everyone can believe in. The heart of what FLOCERT does is ensure a trusted, fair exchange between people. Our conceptual development for the brand drew on that, working closely with the Fairtrade brand guidelines to ensure that the two, so often presented together, worked well in the spaces they share. 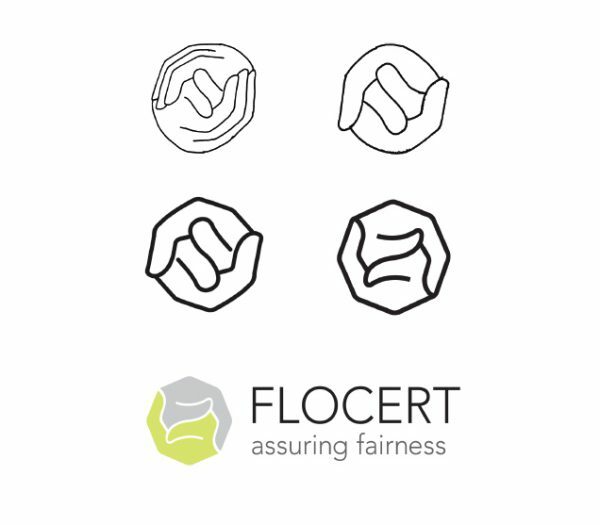 The paired hands of the logo epitomise the human relationships that FLOCERT’s work build as well as sympathetically echoing the yin-yang roundel of Fairtrade. 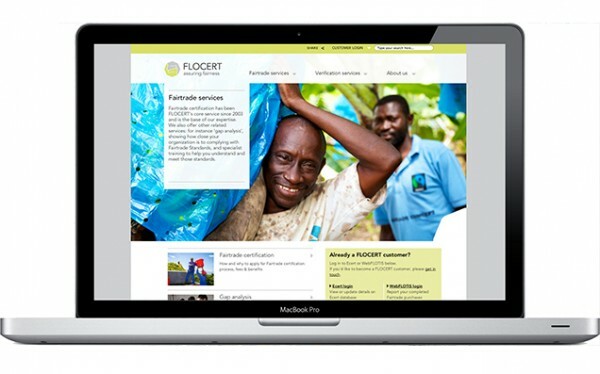 The colour palette is shared with the Fairtrade brand, but the FLOCERT brand is well able to stand alone. Visually, the world of international development and farming is rife with clichéd and patronising images, and that was something we were determined to avoid. We gave high priority to developing photographic guidelines that encouraged a feeling of equal exchange and human interaction, ensuring that international photo shoots brought back vivid images that help drive the new brand concept. We developed the approach to the digital project with more research – looking at analytics to understand how visitors found and used the current website, exploring the digital offer of peers and competitors, and auditing FLOCERT’s existing content and communications. Working with expert people at FLOCERT, we created a range of personas, drawing out the needs and expectations of website users. 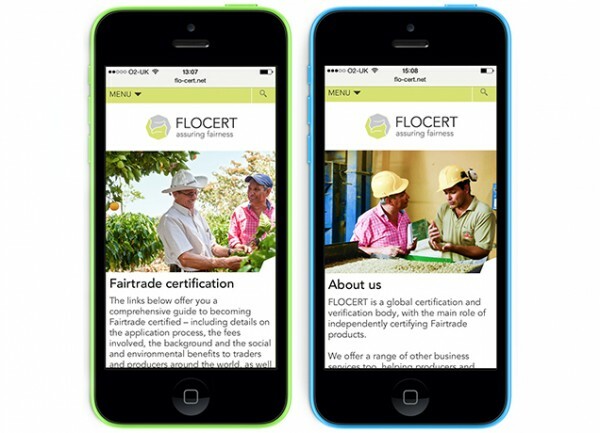 This led to a digital strategy designed to support existing Fairtrade contacts quickly with key day-to-day tasks, while also creating more space for FLOCERT to talk to prospective customers about its new services in social and environmental verification. There were bumps along the way. The business found it difficult to settle on how to categorise its new services, so we worked with senior staff in Bonn to unlock the right categorization to get the project moving again. And during the 17-month process, the makeup of the FLOCERT project team changed. It’s something that happens over longer projects, but it’s always a challenge. We had to adjust how we worked, and spend extra time ensuring that good decisions made back along the project timeline were properly explained and carried forward. Together we persevered. The web planning was carried out collaboratively with the FLOCERT communications team in Brighton and Bonn over a number of sessions, with a strong emphasis on how the site would be used day-to-day by web editors and the IT team. We agreed on WordPress as the CMS that would best meet the requirements, and worked with our excellent developer partners BrightMinded to build a practical, responsive site that delivers services for customers and helps bring the new brand alive. Since then we’ve been working together to develop more of the fresh communications - in social media, on their blog and elsewhere – that are going to be so important as they grow awareness and establish themselves in new markets. It’s something of a dream brief for any branding agency. An organisation with an incredible story that just needs to be told. Truth well told, as the famous advertising adage goes.